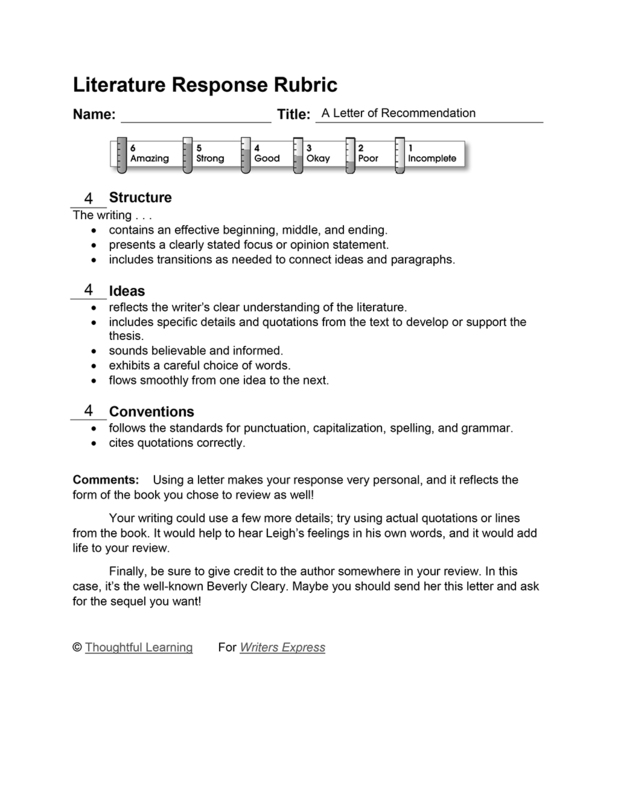 In this sample, a student reviews a book in a letter to fellow readers. The book Dear Mr. Henshaw is about a boy named Leigh Botts. First he writes to an author named Boyd Henshaw. At this author’s suggestion, Leigh begins to write in a diary. So the book shows both the letters from Leigh and Mr. Henshaw and Leigh’s diary entries. I liked this book because it has a good plot and theme. the theme is that you should try to see things from other people’s point of view. If you read the first few paragraphs (or letters) you will see that this boy, Leigh, lives with his mom and dad in a trailor park with a dog Bandit. The main characters are Leigh Botts, Bonnie Botts, Bill Botts, Bandit, Boyd Henshaw, and Mr. Friendly. You can really feel Leigh’s anger and his happiness and his sadness too, because each letter describes what he is feeling. The ending of this book was the only weak point because it does not tell what happens to Leigh or his family. I hope someday the author writes another book about Leigh and his family. A Letter of Recommendation by Thoughtful Learning is licensed under a Creative Commons Attribution-NonCommercial-ShareAlike 4.0 International License. Based on a work at k12.thoughtfullearning.com/assessmentmodels/letter-recommendation.